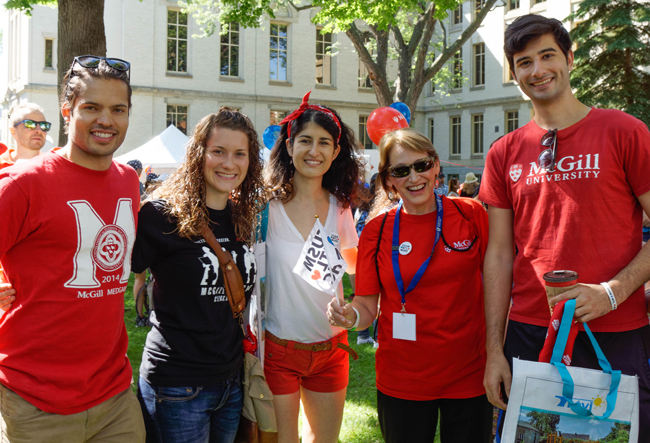 Under the piercing blue sky of a perfect summer day, thousands and thousands of Montrealers walked three kilometres from Dawson College to the new MUHC Glen site on Saturday to join in the ribbon-cutting for the new, state-of-the-art hospital. They marched, they cheered, they partied. Led by pipes and drums and Montreal Mayor Denis Coderre, the blocks-long procession made its way along Sherbrooke St. before turning south on Décarie Blvd. to march under the new railway overpass and onto the sprawling site which is the new home of the Royal Victoria Hospital, the Cedars Cancer Centre, some functions from the Montreal General Hospital, the Montreal Children’s Hospital, the Shriner’s Hospital and the Montreal Chest Institute. The MUHC Research Centre is also present on the site. 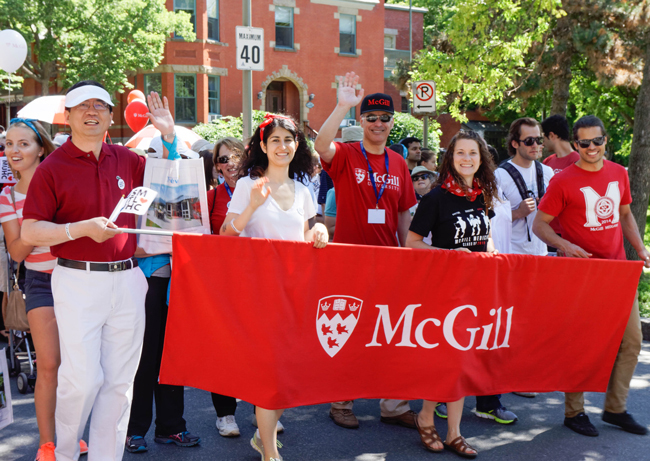 McGill Principal and Vice-Chancellor Suzanne Fortier and David Eidelman, Dean of Medicine and Vice-Principal (Health Affairs) led a McGill contingent of more than 100. MUHC President Norman Rinfret led a huge contingent from the Health Centre. Other notables in the crowd included former Montreal Canadiens Réjean Houle, Yvan Cournoyer, and Sergio Momesso, along with Habs physician Dr. David Mulder of the MUHC. There were also teams of marchers from the corporate world and Concordia University, as well as several community organizations. After the ribbon-cutting ceremonies and speeches, which included remarks from Governor-General David Johnson, provincial Health Minister Gaetan Barette and Principal Fortier, musical performances from the Sam Roberts Band and Stéphanie Lapointe kept the crowd hopping. The party continued on into Sunday, with performances from Montreal Jubilation Gospel Choir, pianist Oliver Jones and jazz singer Nikki Yanofsky; a community festival; a ball hockey tournament; arts and crafts stations and a reptile zoo.